Its no secret that Facebook has become less of a place to socialize and catch up with people online, and more of a place to whine and grip about ones problems. 85% of the time, yes I made that statistic up, its drama filled, and causes me to lose just a little more faith in the intelligence of the human race, but every once in a while, something amazing happens because of it. Let me tell you a story of such a time…. My friend Jacqueline is an amazing woman. Her positive attitude and generosity are inspiring. She is also a social worker. Not the child protective services kind, but the kind that helps less than fortunate families. She has a job I would never ever ever in a million years be able to do. And not because I don`t care about helping others, but because she sees things on a daily basis that I would never be able to handle. Five hours later people had donated living room furniture, clothes, food, money, beds, a Christmas tree, and Christmas gifts. 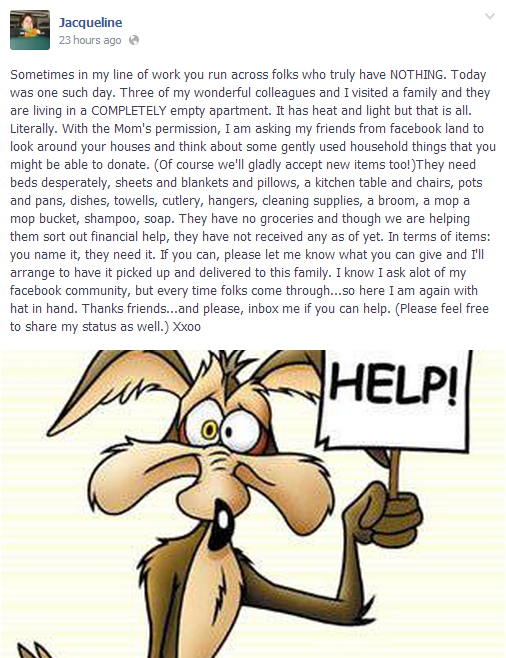 Its amazing how quickly a community can pull together and be so generous to help out a family in need. And while I have no doubt that Jacqueline would have worked miracles for that family without Facebook, it was certainly made all the more easier because of it. Things like this really help put stuff into perspective. When you think you`ve got it bad, it really truly could be worst, and is for some people. It warms my heart to see how wonderful people can be and puts me even more in the mood for the holidays.